Grevillea ‘Austraflora Jubilee’ is a hybrid whose parents are said to be Grevillea rosmarinifolia and G. alpina. This colourful hybrid develops into a rounded shrub that reaches a height of one metre with a similar spread. Oblong leaves have pointed tips. The flowers are an eye-catching red-brown and yellow and carried in clusters. They appear in winter and spring with sporadic flowering at other times. Occasional light tip pruning is appreciated. 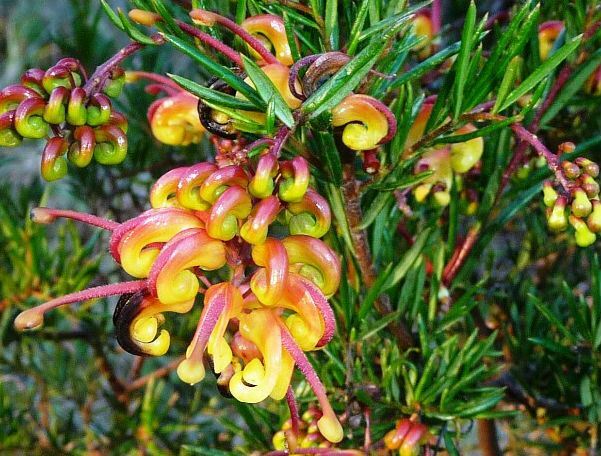 Grevillea ‘Austraflora Jubilee’ could be grown as a foreground plant in native garden beds or in native cottage gardens and rockeries.